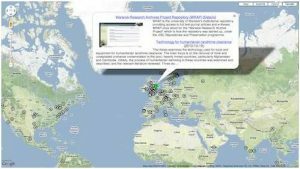 For Open Access week, the Registry of Open Access Repositories has launched an animated world map that gives a dynamic overview of Open Access across the globe. Â Picking one recent deposit at a time, the animated map cycles around the world’s repositories showing a description of the deposit itself, together with a description and thumbnail of the repository’s home page. Every few seconds another deposit is chosen from another repository, making an interesting trip around the World of Open Access. Of course, Stirling University’s own Open Access Repository, STORRE, is one of the featured repositories.